Please Don't Touch My Challenger Stainless Car Show Plaque Please Don't Touch My Challenger Stainless Dash Plaque, Please Don't Touch My Challenger Car Show Dash Plaque, Please Don't Touch My Challenger Carbon Fiber Style Dash Plaque, Please Don't Touch My Challenger Blue Dash Plaque, Please Don't Touch Plaque, [ACC 171006 Challenger Plaque] - $29.95 : 3rd Strike Performance, Your Source for Late Model MOPAR Performance Parts and Accessories! You love your Challenger and you love to show it to others....but not so much when they touch it. Tell them nicely and with style...don't touch my perfectly pristine and detailed vehicle. 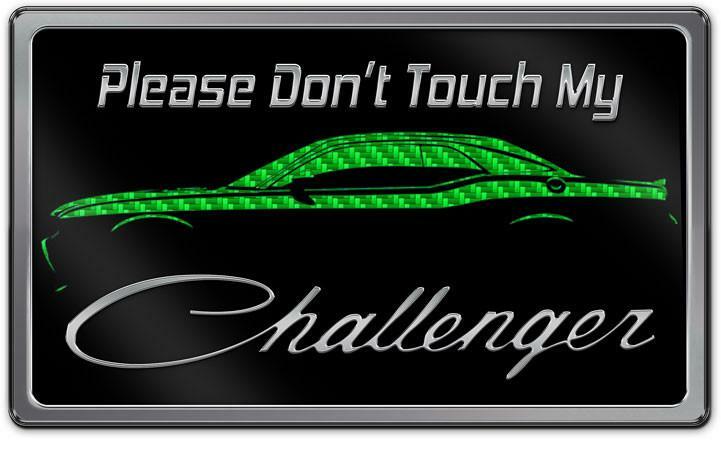 Our "Please Don't Touch My Challenger" Stainless Car Show Plaque is the perfect way to say please keep your hands off my Challenger. After all, you want to win shows not just polish fingerprints off your car all day. The smooth finish is safe to place anywhere on your vehicle's interior or exterior. This plaque is available in 8 printed carbon fiber colors to coordinated with your vehicle. Dimensions are 8" x 4.75". Makes a great gift for any Challenger owner!